Happy Good Friday everyone! I've been a little under the weather lately and work has been keeping me busy so we've been a little quiet on the blogging front. However, I've come back refreshed and ready to share all things beauty. 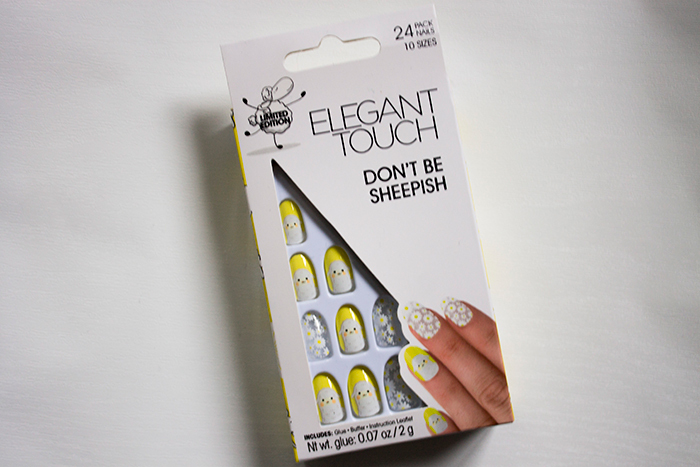 As Easter is just around the corner, I thought I'd share these very cute nails: the Elegant Touch Don't Be Sheepish Nails, a limited edition set perfect for this time of the year. Here's what I think of them. It's been a really long time since I've popped on a pair of false nails. It's not that I don't like them but most of the time they're far too big for my small nails and I change my nail polish far too often to often justify getting the false ones. However, it's always nice to try something different and I love the ease of cute nail designs without spending hours with a dotting tool and mountains of nail polish remover. I've always been a big fan of the Elegant Touch nails because they seem to be much smaller than your average false nails so I know I can get a full use out of them. The Don't Be Sheepish version comes with 24 nails, 10 sizes and two designs: a clear daisy design and a little sheep on a yellow background. I've had too many complements on them to count, it seems like everyone is a fan. Application was easy. I always choose my nail sizes first before glueing, pop the nail glue over my nail, press on and the nails set within a minute or so. The set also comes with a little nail buffer which I found really handy, I used this over my nails before applying the glue which makes it stick so much better. As for how long they last, I found I got a full 4 days wear before any nails started to chip or break and even then it was just the one nail. The good news is with the variety of nails, it was easy to replace the broken false nail with the extra one and my manicure was as good as new again. I was really impressed by these nails, I'd definitely look into more of their designs for the future. 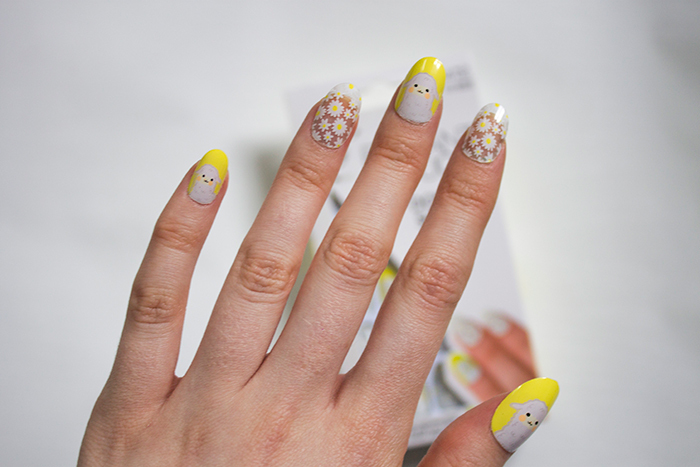 If you're looking for something Easter themed for your nails without the hassle.. definitely give these a go!